Among the treasure trove of Francis Quirk paintings and drawings that went up for auction in Maine were several sketches for works and preliminary drawings. 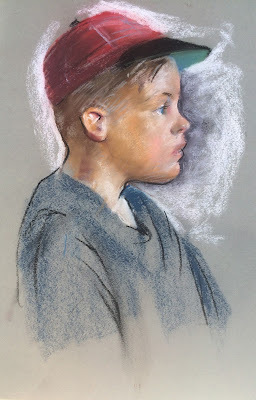 The first is a sketch for a later portrait that we have not found. It is interesting to see how he is thinking of how the face fits in with the background and the tool in his hands. In some ways the older gentlemen (possibly a farmer) could be seen as fitting into the same genre as "The Summer Pastor." Water Color Study for Portrait by Francis Quirk. The second is a watercolor sketch for a portrait of a young man and his dog. Could this be a sketch for the painting of Scott Adams III that won the Juror's Prize at the Providence Art Club's 1932 Exhibition? The hunting outfit, furniture and dog indicate a person of some degree of affluence. The discovery of the original painting will provide the answer. Next we have two pastel sketches of two boys heads in profile. 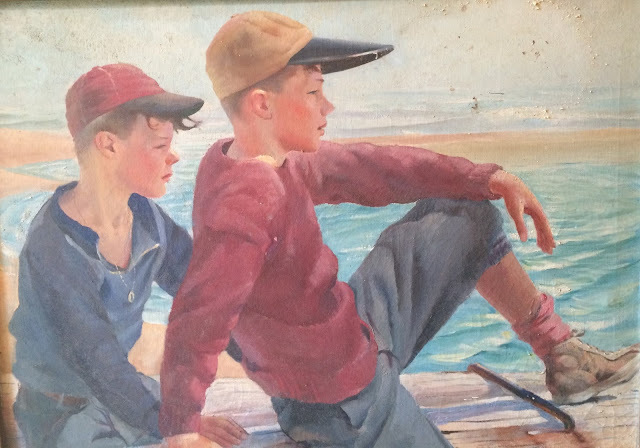 They were studies for the oil painting of the boys at the shore. Could one of them possibly be his son James?